Alexander, G. M. 1986. Military logistics. Journal of Defense and Diplomacy. Beaumont, R. A. 1985. Beyond teeth and tail: The need for new logistical analogies. Military Review 1985. Brown, K. N. 1987. Strategics: The logistics-strategy link. Washington, D.C.: National Defense Univ. Press. Creveld, M. van. 1977. Supplying war: Logistics from Wallenstein to Patton. Cambridge: Cambridge Univ. Press. Dupuy, T. N. A genius for war: The German army and the general staff: 1807-1945. Englewood Cliffs, N.J.: Pretice Hall. Eccles, W. E. 1950. Operational naval logistics. Washington, D.C.: Government Printing Office. Eccles, W. E. (1959) 1981. Logistics in the natinal defense. Harrisburg, Pa.: Stackpole. Eccles, W. E. 1965. Military concepts and philosophy. New Brunswick, N. J.: Rutgers Univ. Press. Freedman, L. 1986. Logistics and mobility in modern warfare. Armed Forces 1986(February). Huston, J. A. 1966. The sinews of war: Army logistics 1775-1853. Army Historical Series. Washington, D.C.: Office of the Chief of Military History, United States Army. International Institute for Strategic Studies. 1969. Military logistic systems in NATO: The goal of integration Part 1-2. London: IISS. Kelley, R. C. 1977. Applying logistic principles. Military Review 1977. Kennon, J. E. C. 1983. 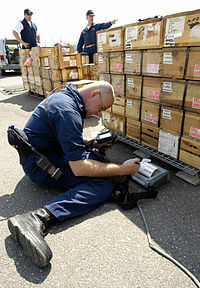 Logistics and the Royal Navy. Journal of the Australian Naval Institute 1983. Meixner, D. 1895. Historischer Ruckblick auf die Verpflegung der Armeen in Felde. 2 volumes. Vienna. North Atlantic Treaty Organization. 1989. NATO logistic handbook. Brussels: NATO. Pagonis,William G.1922. Moving Mountains: Lessons in Leadership and Logistics from the Gulf War,Harvard Business Review Press 1992(August). Peilow, B. F. 1987. Should logistics replace administration as a principle of war? Naval Review 1987. Reed, J. 1988. A look at current and future logistic systems. Armada International 1985. Thorpe, G. C. (1917) 1988. Pure logistics: The science of war preparation. Washington, D.C.: National Defense Univ. Press.